Tarp Buddy, LLC is the provider of the Tarp Buddy. 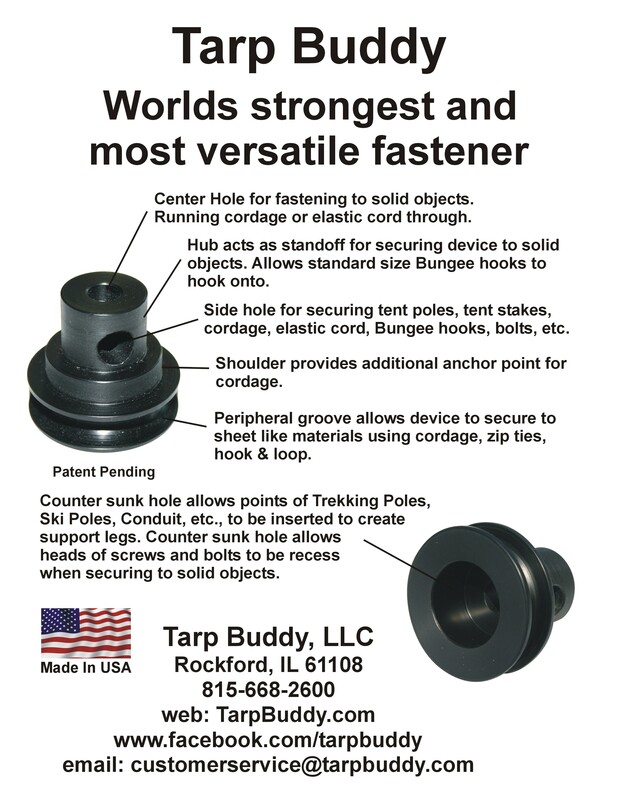 The Tarp Buddy is the world’s strongest and most versatile fastener. Does not require holes in the material to install. Secures to tarps, canvas, plastic sheeting, screen material, and so much more. Secures using cordage or zip ties. Allows the use of tent poles, tent stakes, and trekking (hiking) poles. Can be secured on the ends of rubber snubber’s and to buildings, truck beds, trailers and boats. Receives the hooks of bungee’s and rubber snubber’s. Allows multiple layers of material to be drawn in to the groove for securing depending on thickness of materials. Can be bolted directly to truck beds, trailers, boats, sides of buildings, trees, and so on. I have spent years using tarps, custom covers, plastic sheeting and other assorted sheet-like materials to cover just about anything imaginable. The common problem was that the grommet would always rip out and they were almost never located where I needed them for an anchor point. I have used all sorts of natural items as well as different types of fasteners. Most were not worth the time, money or effort. Some worked better than the grommets but only for a little while before damaging the material. I finally decided there had to be a better way. That’s when I created the patented item that is known today as the Tarp Buddy. I am an outdoors person. I like to camp, backpack, and hunt. 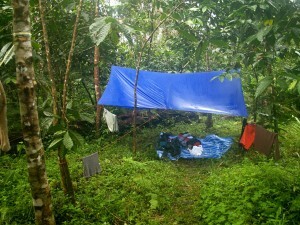 I have used tarps and other sheet-like materials for my hobbies as well as on the job. I knew I wanted to create a fastener that not only would be the strongest fastener out there as well as providing the longest longevity for the material and the fastener, but I wanted to combine the worlds of camping, backpacking, hunting and tarps. The Tarp Buddy opens up an entirely new world of how tarps and other sheet-like materials can be used. 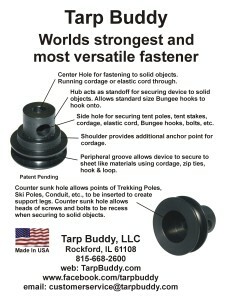 Whether for personal, business, military, or FEMA, the Tarp Buddy has you covered. Tarp Buddy © 2019. All Rights Reserved.